"I got this design because when I was a child, I often found four-leaf clovers. I had a page in a photo album with them pressed under the plastic; I must have found at least fifty. The flower that goes with clover in central Illinois, where I grew up, is a plain white thing that smells sweet en masse. I want to carry that confidence and hope with me, to hold in my mind the idea that I could stumble across something magical at any time. So my skin says home and hope and luck. The amazing poet and artist Ruth Awad did the tattoo." Ruth, incidentally, will be appearing before month's end on these very pages. In an interview you said nothing had ever happened to you. But the world happens to us every moment—the bed happens exactly as you lie down on it, the cat with its eyes closed in the sun is happening perfectly when you see it, the doubt happens slimy in your throat at the worst time (because every time is the worst). You were being humble. I am not trying to contradict you. I only want to say that it matters, this moment with the window closed, keeping you in. Katherine (Katie) Riegel’s latest book is Letters to Colin Firth, winner of the 2015 Sundress Publications Chapbook Competition. Her others include What the Mouth Was Made For, Castaway, and the anthology All of Us. She blogs to change the world with a collective of women writers at thegloriasirens.com. 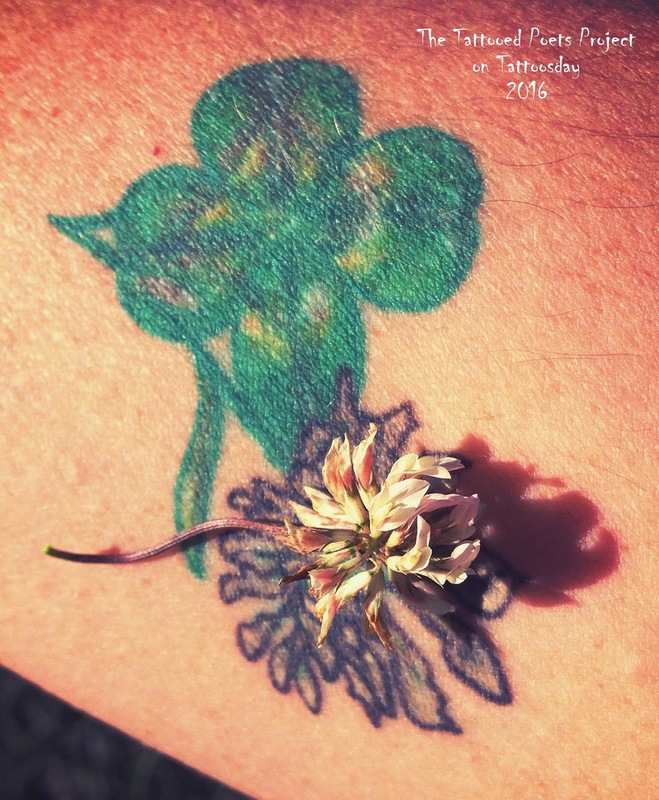 Thanks to Katie for sharing her tattoo and poem with us here on the Tattooed Poets Project on Tattoosday!